Regular Employee – An employee engaged to perform activities which are necessary or desirable in the business of the employer except if employment has been fixed for a specific project. An employee is considered a Regular Employee if work rendered is at least 1 year. Probationary Employee – An employee engaged to perform activities that will not exceed 6 months from the commencement of work. An employee is considered a Probationary Employee if work rendered is within 6 months. 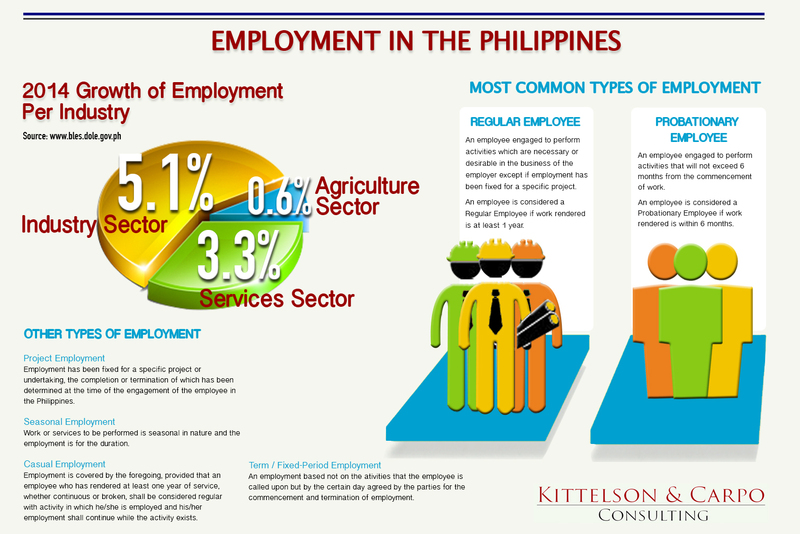 Project Employment – Employment has been fixed for a specific project or undertaking, the completion or termination of which has been determined at the time of the engagement of the employee in the Philippines. Seasonal Employment – Work or services to be performed is seasonal in nature and the employment is for the duration. Casual Employment – Employment is covered by the foregoing, provided that an employee who has rendered least one year of service, whether continuous or broken, shall be considered regular with activity in which he/she is employed and his/her employment shall continue while the activity exists. Term/Fixed-Period Employment – An employment based not on the activities that the employee is called upon but the certain day agreed by the parties for the commencement and termination of employment.